Saturday Afternoon: Spent serveral hours at the Cambridge Brewing company nursing a full round of samplers. Overall pretty good beer. There was a cherry flavored one that I didn’t like so much (I tried real hard though). Saturday Night: Dinner while watching Flashdance. Two separate last minute sprints. One to get to the liquor store before 11 and the other to get to the T before 12:30. I stayed up far too late. I must be getting old. 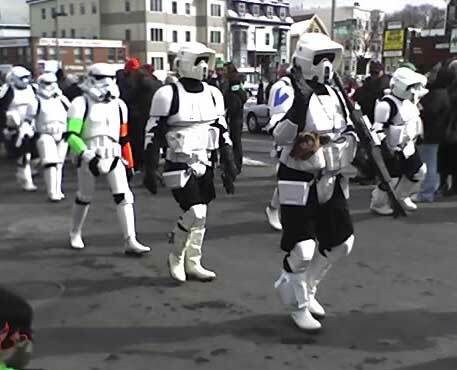 Sunday Afternoon: St. Patrick’s Day parade in Southie. Pretty fun but very cold. 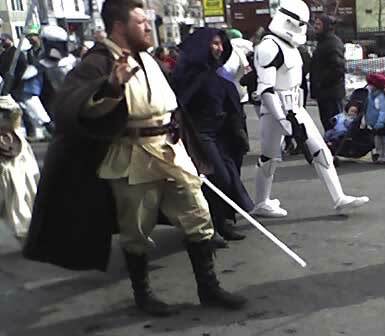 I’m not sure why, but there was an entire group of Star Wars characters in the parade. Spent the rest of the afternoon at “Ace’s High.” A very sad bar with an empty dance floor and strobe lights (on a Sunday afternoon). Later on in Downtown there were some tasty sweet potato fries. Sunday Night: All the Kings Men at the the Milky Way Lounge. A very good show which included full renditions of Dolly Parton’s 9 to 5, NSYNC’s Bye, Bye, Bye and Michael Jackson’s Thriller. I can’t forgot to mention the fantastic version of “Agony” from Into the Woods.